The taupe-colored colonial house at 1116 Weed Street was built in 1900 and has all the charm of an elegant 1900 country manor house mixed with modern amenities. NEW CANAAN — Sycamore trees are known for their longevity and size. They can grow as tall as 100 feet with a trunk as thick as 10 feet in diameter and a canopy that can spread to more than 60 feet. Sycamores can live more than 200 years so the majestic sycamore tree in the backyard of 1116 Weed Street probably witnessed the construction of the house 118 years ago. That also means this house enjoys the same longevity and majesty of the tree with which it shares space. Both tree and house occupy a 2.21-acre level property, and as the tree has grown so has the house. 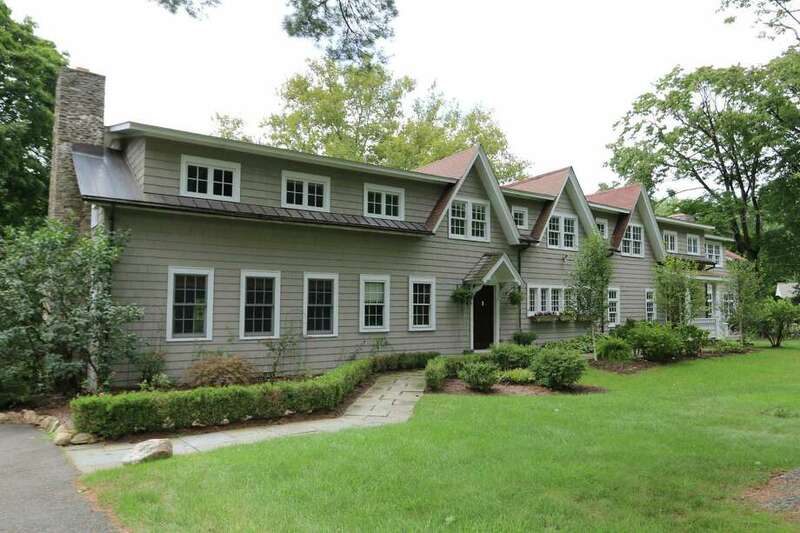 The taupe-colored colonial was remodeled and expanded in 2010 to 5,796-square-feet. No child could resist the urge to climb this tree, one of the oldest sycamore trees in the town, but this yard enjoys another recreational venue of a man-made sort. There is a bocce court at the back of this yard, and above the detached three-car garage - which is topped by a rooster weathervane, there is a recreation or game room that will keep any child, or adult, occupied when the weather discourages outdoor play in the shade of the massive tree, on the bocce court, or elsewhere in the sizable yard. Should one want to stray from this attractively landscaped property they needn’t go far to find things to do. Irwin Park and the New Canaan Land Trust’s new GreenLink Trail are within easy walking distance, and the town center and train station is not much farther. The house itself is a clever mix of old and new. The first floor has all the charm of an elegant 1900 country manor house, the listing agent said. The early character remains in original rooms, although they have enjoyed updating, and the newer spaces have all the amenities required for contemporary living and entertaining including a new, custom designed kitchen with a fireplace. Entrance into the house is via a slate path that leads from the driveway to the front door. Along the route there are attractive gardens including roses, a Japanese maple, a large lilac bush, ferns, birch trees, and a row of hedges that conforms to the winding path, which opens to create a small front patio. The window boxes are filled with colorful mums just in time for the arrival of autumn. If one follows the driveway all the way around to the back of the house it passes the sycamore, leads to the garage and circles back. Inside, the large foyer provides access to the formal sunken living room to the left, the formal dining room to the right, and the library straight ahead. The living room features a stacked stone fireplace, built-in cabinets, and two sets of French doors to a covered porch. Step up from the living room into the library, where there is paneling on the lower walls, wide-planked wood flooring, a coffered ceiling, and a door to an open porch. In the banquet-sized dining room there is a fireplace flanked by built-in window seats and a coffered ceiling. The cavernous gourmet kitchen features a shiplap coffered ceiling, large center island topped with an ogee-edged wood counter, granite counters - also with a beveled edge, two farm sinks - one in the island and one on the perimeter counter, and a door to a porch and the yard. High-end appliances include a Wolf six-burner range top and grill. Off the kitchen there is a sizable breakfast room and a large walk-in pantry. The family room has a fireplace and French doors to the yard. In the mudroom there is a powder room, an informal door to the front yard, and access to the rear stairs. On the second floor there are five spacious bedrooms and four renovated baths. The master suite features a fireplace, large walk-in closet and new luxurious Carrera marble bath. On this level there is also a huge play area or exercise room and an office. For more information or to make an appointment to see the house contact Marsha Charles of Coldwell Banker Residential Brokerage at 203-904-4663 or marsha.charles@cbmoves.com.